Staffan's musicial interest began at the age of nine when he started to take piano lessons. After seven years behind the piano he bought his first synthesizer and started a rock band together with a couple of friends. The years with the rock band resulted in a couple of local live performances and they also participated on a compilation album, which felt more fun and inspiring than the hours that he spent with the piano. His first contact with spacesynth was back in 1987 when one of his friends played the Laserdance album "Future Generation". Since then, he has played the Laserdance and Proxyon albums frequently on his stereo, which he still does. He became fascinated by Laserdance mostly because of the wonderful atmosphere, melodies, harmonies and the energy in the bassline. He also came in contact with Koto and Hypnosis but he didn't think that they brought the same magic feeling as Proxyon and Laserdance. In 1991 he bought his first Amiga 500 and started to compose tracker music. Those songs were made just for fun and were never published for the public. The music that were made for computer games and the demo scene at that time has influenced his way to compose spacesynth music. Synthesizer music with lots of details and good melodies and harmonies is something that he priorities, which can be found in many of the songs that were made for the demo scene. After that, a couple of years followed when he didn't compose almost any music. In 1999 he bought himself a synthesizer and by a coincidence he found the website laserdance.de and got inspired to start composing music in the genre that we nowadays call spacesynth. A couple of songs were published at mp3.com and after receiving some positive feedback he decided to continue in that direction. In 2005 he joined the spacesynth.net team together with Jouni and Lauri which have been a fun and inspiring time. He made his album debute on the compilation album "Contest Traxx" which was a result of a music contest that was held at the website spacesynth.de. In these days he is using a quite limited studio that consist mostly of software which suit his needs quite well. The software oriented studio can be started up and shut down very quickly which is something that he likes as this increases the productivity even though the sound can't compare with analogue studio equipment. 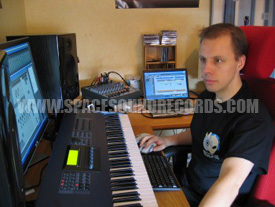 At the end of 2007 he started to compose music for Space Sound Records which so far have resulted in a remix on their album "The Return Of Space Raiders" and more songs will follow soon. I live in a small town in the northern Sweden called Umeå where I'm working as a software engineer for the telecom market. Actually, both Johan Koskela (Paralyze) and Johan Lindgren that participated on the album Synthesizer Dance volume 6 lives here in town, but I haven't been in contact with them in real life. At the age of nine I started to take piano lessons and continued with that for seven years. I think that it was my mother's decision and I'm glad that it became piano and not some other instrument like the violin. At that time I wasn't inspired to spend my spare time with playing the piano, so it felt more like something that had to be done (like the schoolwork). After that, I bought myself a synthesizer and started a rock band with a couple of friends. We played mostly covers and I think that it was a nice time. We made a couple of live performances and also included a song on a compilation album (a live album). One thing that I've seen during my musical journey is that the way I compose music has changed quite a lot during the years. At the time when I took piano lessions I was using my both hands (of course) and when I started to play synth in the rock band I only used the right hand to not interfere with the bass-player. Nowadays I mostly use one finger at a time or just use the computer-mouse to add the notes one by one. I wonder what the next step will be. Some year ago I bought an electric guitar and started to take guitar lessons. I find the guitarplaying very relaxing and it give a completly different freedom than composing music with the synthsizers and the computer. I still prefer the synthesizer though as it is much easier to vary the sounds. I spend a lot of time for sports (squash, team cycling, body pump, orienteering, etc) which I think is both fun and necessary as I spend much of my working time with the computer. I must say that it is not often that I like the music that they are playing at the training sessions, like for example at the team cycling sessions. It seems like I have a completly different taste of music than the one that is played nowadays (rnb, hiphop, etc ie. music based on rhythm without any melodies or soul). Actually I listen to most kind of music (jazz, fusion, pop, rock, heavy metal, soul, electro, etc) but at the moment I mostly listen to spacesynth. A friend at school who introduced me to Laserdance/Koto/Proxyon has now introduced me to two other bands in the electronic style. Mind.in.a.box and In Strict Confidence have both well produced and interesting music which I can recommend. Mind.in.a.box are very talented to handle the vocoder and I'm sure that many of the spacesynth fans would like their music too. Just check out their pages at myspace and youtube for some musicsamples. No, actually I only compose spacesynth at the moment. I don't know why it has become like that. I guess that it is because I still have a lot of things to learn and many ideas that I would like to try out in this genre. 6. How did you find spacesynth and when did you first come in contact with this genre of music? A friend at of mine played the Laserdance-album Future Generation back in the 80s and since then I have listen frequently to Laserdance/Proxyon/Koto. As the Laserdance-albums were difficult to buy here at that time I asked my friend to make a copy on a tape cassette, which was 1988-06-08 according to the notes I have written down on that tape. So it is soon 20 years anniversary for me. Back in 1999 I found some songs by Anders Lundqvist and mindXpander at mp3.com and they had some weblinks to the spacesynth community at laserdance.de which I visited and the rest is history. There are many elements in the spacesynth music that fascinates me. The melodies and harmonies comes in the first place for me and I really like songs with strong melodies that you can remember long time after you have turned off your stereo. Songs that include lots of details and change sounds frequently makes them enjoyable to listen to over and over again. Sometimes it is necessary to use headphones to be able to hear all the details. Finally the atmosphere and the drifting-in-space feeling must be mentioned. Whether people like the space theme or not I think that the space-atmosphere is something that can add much to the song and also give a unforgettable feeling especially when you listen to the song with headphones. Many musicians are focusing on the soundquality rather than on the contents itself and therefore many of the songs sounds quite similar. Instead I would like to hear some new and unique melodies rather than songs that only include a bassline and some arpeggio-sequence that goes blipp-blopp. I really like the generousity that many musicians show when they share their songs for free, which can be a good opportunity to get some constructive criticism. The forums are sometimes very quiet which probably is a result of a limited choice of albums. The IRC-channel is much more active than the forums and I recommend that all people that are interested of spacesynth try to visit that channel. Laserdance, Proxyon, Koto and many of the tracker-songs from the Amiga demo scene. Some years ago I made a co-op with Dreamtime which resulted in the song A Step Into The Void (the song can be found in the first tutorial at spacesynth.net) and I learned many things from that time which I'm using when I compose music nowadays. Laserdance is still my favorite. Their first four albums are magic in my opinion and I think that they include all things that can be expected from good spacesynth music. There is something special about their music which is quite difficult to explain in words. The melodies, a sentimental mood and a great atmosphere are some important factors in their music. Something happend with Laserdance after the first four albums as the sound became more crispier and clean and the melodies started to sound simplier and more predictable. Earlier I didn't thought that we could expect any more albums that sounded like Laserdance first albums, but when Macrocosm released their debute album First Mission it was obvious that I had been wrong. Laserdance - Future Generation. It is well done and include many interesting details and sounds that makes it interesting to listen to over and over again. It sounds like the whole album consist of just one long song as the songs don't end by fading out like on other albums. Instead the next song starts up just after the previous one has ended (with the same kind of sounds). It took some time for me to understand where the different songs started and ended. My overall favorite song is The Ordeal by Anders Lundqvist. I think that song represents the spacesynth genre very good. Powerful drums, driving bassline, wonderful leads that are changed frequently. The melodies and harmonies are great and give the song a nice mood. This is the song that I would play if I should try to invite someone to the spacesynth genre. A co-operation with Rob van Eijk would be interesting. He seems to be a nice person that has many interesting ideas and good skills of making music. I like his songs (technicality, melodies, mood) and the only thing that I don't like is the trancy sounds that he and Michiel started to use on the Area51-albums. The rest is very good. Co-operation is something that I really recommend to other musicans as it is a good way to get feedback of your work and you can learn a lot from it. I like many italo disco albums from the 80s. Artists like Roy (Destiny Time), Brian Ice (Talking To The Night), Spagna (Easy Lady), Max Coveri (One More Time) and Albert One (Hopes and Dreams) were great. I have not listen to the new italo disco music though. No, I didn't compose anything for the demo scene. I start by creating the drumtrack and then I add the bassline.After that I start searching for some useful leadsounds which is a quite time consuming phase. Then I start improvising the melodies and finally the chords are added. When everything has been added I try to add some windsweep- or orchestra hit-sounds between the melodies in case there are two melodies that sounds quite different from each other. Yes, melodies are the reason why I listen to spacesynth. It is not only the melodies that are important as a nice harmony and a good mood is also needed. In my opinion a good melody shall not sound simple and predictable as that will make the song quite boring in the long run. Of course it is possible to add some background effects like arpeggio-sequences and panning pads to make the song less simpler, but the best way is to focus on the main melody in the first place. I must say that in many cases I prefer the songs from the demo scene instead of the new ones even though the soundquality is much better nowadays. It all comes back to the contents in the song which I prioritize in front of the sound quality. At the moment I assume that my music fits more into the classical area. It is interesting that you are asking this question now as I'm planning to move into the Protonic Storm style soon :) It will be more athmospheric feeling, longer and more improvised melodies and a less predictable song structure. The melodies are a important factor for spacesynth and without that I think it wouldn't be spacesynth (it would then be something like electro, electronica, trance or techno). The classical arpeggiated 16-beat bassline feels overused these days and I think that it is time that people (including myself) start to add some variation to the bassline sequence. It would be interesting to hear some new influences when it comes to the drums and the rest of the sounds (leads, chords, etc). Ohh, this is a interesting question and I think that we can discuss this subject for a long time. I'll try to keep my answer short. When it comes to the musically aspects I think that I've already answered that in the previous question so I will now answer my thoughts about how we could improve the popularity for the genre. - Websites like myspace, mikseri, youtube, etc are all great places for musicians to spread their music to people that haven't heard spacesynth before. Just remember to add a comment about the websites spacesynth.net, spacesynth.de, spacesoundrecords.com, etc so that people that likes the music know where they can go if they want to find some more music in this style or to discuss the music at the forums. - The spacesynth music should work really good in computer games and I think that it would be good if the records labels could try to include some of their best songs into some popular games. We know that Gustaf Grefberg has already done that with his songs and it would be nice if more people can follow in that direction. - The japaneese music market is big and I think that the records labels in this genre should investigate if it is possible to have some distributors there. I assume that the spacesynth music would fit good in the japaneese music market. Some of the already released spacesynth songs have included some japaneese influences. - SSR's idea to make spacesynth covers of Depeche Mode songs is good and probably that idea could be used also for other type of songs. Note that the covers don't necessarily need to be instrumental. - The musicians in this genre are mostly amateurs and it would be great if we could invite some professional musicians with good musicial knowledge. For example, musicians like Chris Hülsbeck that have been working with music for the computer game market would be interesting to have in the genre. I think that we should aim for musicians that don't just compose music for the money otherwise it would probably be difficult to persuade them. In these days I'm using a quite limited studio that consist mostly of software which suit my needs quite well. The software oriented studio can be started up and shut down very quickly which is something that I like as that increases the productivity even though the sound can't compare with analogue studio equipment. - Soundcard: Creamware Pulsar2 (it includes many VST-synths, but I never use them). - Other stuff: Event ASP8 (active monitors), Behringer Xenyx1622FX (mixer), X-Can v3 (headphone amplifier), Sennheiser HD650 (headphones), Dell 3007WFP (30 inches LCD-monitor). My portable studio consist of a Laptop (Pentium M 760 2GHz) and a Novation X-Station 25 (Keyboard and soundcard). When it comes to spacesynth it doesn't require any powerful computer as many of the sounds are quite thin (compared to trance and other genres). The best solution would probably be a mixture of HW- and SW-synths concerning both the cost and the result aspects. At the moment it is possible to get old HW synths like the M1, D-50, Juno 106, etc for that same price as for the new SW synths and I assume that it would be easier to get the money back later if you try to sell a old HW-synth compared to a SW-synth. Another aspect is the performance problems that often occurs with the new powerful SW-synths. Some new DSP-powered soundcards are developed these days to solve that problem and some other companies try to use the performance in the graphiccard for the SW-synths. Until these kind of performance problems have a solution that is worth its price I think that a mixture of SW and HW will probably be the best solution. Choose the solution that gives you good inspiration to work with and that you think is the most efficient one. Stefan Bieri and Karel Post seems to have good progress in their hardware based studios, so SW is not always the most efficient solution. At the moment I haven't found any vocoder that can give the same warm sound as the hardware vocoders. 22. What’s your favorite TV show? The swedish television broadcasted a police-serie this spring called Wallander that I really like. It has a nice relaxed feeling where the police tries to solve murders in a small town in the southern part of Sweden. 23. Anything you would like to say to the people in the Spacesynth Genre? I would like to recommend all musicians to try to make co-operations with other musicians. It is fun and you will learn much. Remember to play your songs to people/friends who usually don't listen to this kind of music and hear their opinion. People often say that all spacesynth-songs sounds the same (same bassline, etc), but that is something that I think is common for songs in any genre. If you ask me about Country music then I think that all those songs sounds the same. The whole thing about music within a genre is that they all have something in common, so I don't see any problem with the fact that many spacesynth songs are using the same kind of bassline. Spread your compositions at places like myspace, youtube, mikseri, etc and don't just spread the music to people that have already found this genre. That can help the genre to grow. Remember to mention our websites spacesynth.net, spacesynth.de, etc at the place where you publish your songs so that people that like your song know where they shall go if they like to hear more music in that style and to discuss the music at our forums. 3. Demo or Italo? Demo. 4. TV or Sport? Sport. 6 Resort or Camping? Resort. 8. Cat or Dog? Dog. 9. Beer, wine or Spirits? Wine. 10. Blonde or Bruette? Both. You are welcome. Greetings to you all.